Link to core spreadsheet here. 1 : Reach lv. 300 with the 1 rank under 4:15. 2 : Reach lv. 500 with the S4 rank under 7:30. 3 : Reach lv. 999 with the S9 rank under 13:30 and 126000 pts. I'll have to look mine up, but I know it's under 11 minutes!! 10 Gm players on the list.. I think there is around 20 western Gm players.. 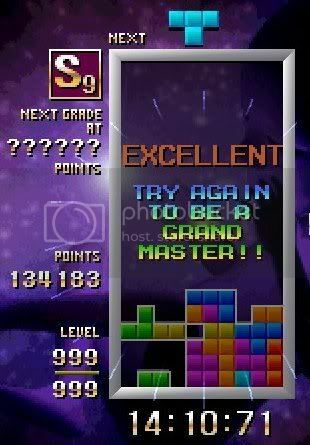 The thing is that a big part of the tetris community do not know this website. What a pity, actually. Tu as raison il y en a bien plus je pense aussi..
Mais t'inquite pas je les ressencerais tous!!! Aie..Il va encore dire que je m'excite trop.. I could post a pic, but I can't be bothered. That's an old record. Well, sort of. Didn't get the mastering time, because I forgot to take a screenshot until after it said "Game Over" It was probably around 10:30 . I wasted a lot of time at S6 and S7 just clearing singles. Just as a question, does the game end at 999, or does it keep going until you either die or hit S9? so, not entirely in the "upper ranks"
Colour_thief told me you have stoped TGM during a long time..
Yea, i've been busy with other projects, a bit rl here and there, etc. Been working on hebo lite lately, brought the tap animated backgrounds into hebo, along with the randomization code..
That will be the same for me.. I will have too work for the next year..
Jago said me you are a killer in programmation on C .. Ya i think i'm gonna have to work on this game. just 3 min before with a keyboard..
as fast as you I think..
GM 13:15:40. Haven't been able to get a good seed to produce a better record. And keyboard is starting to produce errors. I have pretty much given up a better result in TGM1.